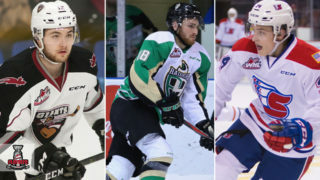 In our fourth of eight opening round 2018 WHL Playoffs previews, we examine the B.C. Division Champion Kelowna Rockets taking on the Tri-City Americans, who earned the first wild card spot in the Western Conference. 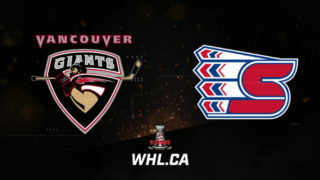 Fans of close hockey will find themselves entertained by the first round matchup between the B.C. Division Champion Kelowna Rockets and wild card Tri-City Americans. After both clubs secured identical 2-1-1-0 records during the regular season series, they’ll battle in a series that will force a winner to emerge after seven games at most. With a 13-13 tie in goals during the season series, the two teams may be separated by eight points in the regular season standings and 500 km geographically, but things have never been closer for the two clubs. On Kelowna’s side is a history of playoff excellence, four Ed Chynoweth Cup Championships, and one Memorial Cup to their franchise’s name, as well as their seventh division title in franchise history, which they earned last week. 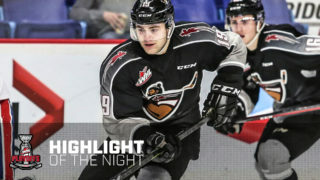 Powering them to that division title were the likes of Kole Lind (Vancouver Canucks) and his 95-point (39G-56A) campaign, Dillon Dube (Calgary Flames) and an 84-point (38G-46A) season, and a team-leading 45 goals from Carsen Tawrynski (Philadelphia Flyers). Adding a 70-point (19G-51) campaign from defenceman Cal Foote (Tampa Bay Lightning) and 65 points (22G-43A) in 66 games from a second-year forward in 2018 NHL Draft Prospect Kyle Topping and you’ve got the makings of a strong team ready to contend for another championship. The Americans are a team that’s enjoyed playoff success in the past, but have yet to truly cement their status as a consistent playoff threat. Even if they are seen as the underdogs against the Rockets, the Americans have certainly got some offensive firepower of their own to strike back with. Morgan Geekie (Carolina Hurricanes) led the Americans with 84 points (30G-54A) with Jordan Topping, the older brother of Kelowna’s Kyle, registering 80 points (38G-42A). Injuries throughout the season caused the Americans to not be the true versions of themselves. Add in one of the best captains in the Western Conference in Michael Rasmussen (Detroit Red Wings) and defensive stars like Juuso Valimaki (Calgary Flames), Jake Bean (Carolina Hurricanes), and Dylan Coghlan (Vegas Golden Knights) and you’ve got the makings of a tough team to beat defensively. 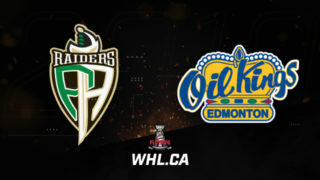 The series will open the 2018 WHL Playoffs starting Thursday, March 22 (7:05 p.m. PT) and Saturday, March 24 (7:05 p.m. PT) at Prospera Place. The series will then shift to the Kennewick, Wash. and the Toyota Centre for the next two games of the series on Wednesday, March 28 (7:05 p.m. PT) and Thursday, March 29 (7:05 p.m. PT).
.@Kelowna_Rockets & @TCAmericans open 2018 #WHLPlayoffs Thursday night! Blasting off at home: When it comes to facing the Kelowna Rockets at Prospera Place, all challengers will need to prepare for trouble and make it double. With 20 home playoff victories over the past three seasons combined, the Rockets aren’t just a formidable team to face at Prospera Place during the regular season. This is a franchise that understands the importance of playoff success and have walked the walk, preferring their record to . With the fifth-ranked home power play in the league, the Rockets can not only strike at even-strength, but always be ready to pounce on every power play. There’s no denying that the Rockets will be heavily favoured when playing in their home rink. Never back down: Despite the teams possessing vastly different trophy cases over the course of their franchise’s history, the two teams have historically matchup up well, with the Americans claiming a pair of series victories over the Rockets. This season in particular, the Americans and Rockets were neck-and-neck throughout their four-game season series with each team winning their home games with a regulation and overtime victory. The Americans’ success against Kelowna has shown that the Rockets are a good team, but they’re more than capable of being beaten with a solid effort. The Americans can make a series of this if they stay on their game and return to what made them successful during the season series. Carsen Twarynski (45-27—72): The offensive contributions of Kole Lind (Vancouver Canucks) and Dillon Dube (Calgary Flames) were significant, but also expected to a certain degree. Hardly anyone could have guessed that Twarynski, the Philadelphia Flyers prospect whose previous career-high was 20 goals, would break out for a team-leading 45 goals, the ninth-most in the entire WHL. Twarynski had 11 multi-goal games this season, with two-goal performances in each of the Rockets’ home games against the Americans this season. The flip side to that was he was silenced in the two road games of the season series. Regardless, there’s no question part of the Americans’ preparations will focus around limiting Twarynski to as few offensive chances as possible, which should ultimately been seen as a compliment to his increased skill level and a challenge for him to overcome. Nolan Yaremko of the Tri-City Americans. Nolan Yaremko (22-34—56): The pride of Spirit River, Alta. was one of two Americans forwards to lead the team in scoring during their season series with the Rockets, tallying six points (4G-2A) and a plus-four rating in the four games. That was one more goal and one fewer assist than teammate Parker AuCoin. Yaremko and AuCoin each tallied four of their points during the two contests at Prospera Place. Since securing at least one victory at Prospera Place is a must for the Americans if they want to win the series, the U.S. Division club will need that pair to be at the top of their game when on the road in order to stand a chance at success. Gordie Ballhorn of the Kelowna Rockets. Gordie Ballhorn (6-36—42): The Kelowna Rockets faced a numbers game when it came to their overage players and ultimately chose to keep the 20-year-old Ballhorn in their defensive ranks. He responded with a a 42-point campaign, while also helping the Rockets be the eighth-best team in the league in terms of goals allowed. His production may not be completely replicated come playoff time, but if Ballhorn can be the quality defenceman he’s been at the other end of the rink, it’ll aid the Rockets’ chance of staying alive in the playoffs. Jake Bean (12-36—48): The Americans made a big splash in the trade market earlier this season, acquiring the Carolina Hurricanes first round draft choice from the Calgary Hitmen just days after he won gold with Canada at the 2018 IIHF World Junior Championship. He’s been a solid component to a blue line that features two other NHL prospects in Valimaki and Coghlan. There were some shaky moments for the team defensively in the 2018 portion of the team’s campaign, but they did end the season 6-3-1-0 and went 8-2-0-0 against the B.C. Division from January 1 forward. 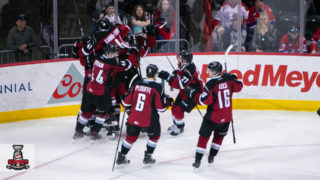 If the Americans’ defence can find a way to recreate that sort of success in the playoffs, they’ll give themselves a good shot at advancing deep into the WHL Playoffs. Brodan Salmond (26 GP, 13-10-0-1, 3.67 GAA, .880 SV%): Neither the Rockets or Americans had a clear-cut number one starter throughout the season. Brodan Salmond made start for the Rockets all the way back on Friday, September 22 in the Rockets’ season opener and started with a 3-1-0-1 record while making some incredible saves along the way. Then, an unfortunate injury sidelined him for a significant enough period for rookie James Porter to come in and earn the title of the team’s top goaltender. Salmond scored some impressive results, going an impressive 9-5 against the B.C. Division, but it was Porter who ultimately started all four games during the season series with the Americans. Jason Smith hasn’t been shy to rotate both Salmond and Porter, meaning the former could see some action throughout the series. Beck Warm of the Tri-City Americans. Beck Warm (35 GP, 16-11-1-1, 3.58 GAA, .889 SV%, 1 SO): Warm responded well to a significant increase in playing time this season with a 16-win season, the fourth-most among 1999-born goaltenders in the league. His 43-save shutout of the Seattle Thunderbirds in November 2017 and 33-save victory over the Rockets at home in October 2017 were just two of his strong performances during the season. He also earned nine of his 16 victories on the road, meaning he could come in handy to the Americans when the series shifts to Prospera Place. Neither Warm or his teammate Patrick Dea have had a chance to fully embrace a playoff series as their own. Dea has made the majority of the starts and a better record, but Warm has also proven himself to be capable when called up. How the tandem fares will be an interesting part of the series to watch. The Kelowna Rockets last won th Ed Chynoweth Cup in 2015. For a team that came into existence in the 1990s, they’ve built their way to success quickly. This year marked the seventh division title for the franchise and they’ll go in search of their fifth Ed Chynoweth Cup with lofty expectations thrust upon them once again. 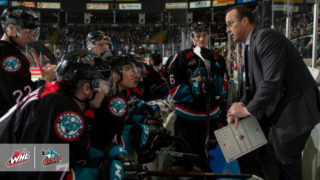 The Rockets have made to the WHL Championship or third round of the WHL Playoffs for four straight years and this year’s squad has no intention on letting that streak end on their watch. Having led the B.C Division this season and held their own against an equally tough U.S. Division, if the Rockets get rolling, is there anyone who can stop them? The Tri-City Americans last appearance in the WHL Championship was in 2010. The Tri-City Americans have been to the league final three times, with their last appearance coming in the 2009-10 season. For how tough the Ed Chynoweth Cup is to win, the Americans are still searching for their first title. The team has had plenty of regular season success, with eight division titles in the franchise’s history, including four in five seasons from 2007 to 2012. Year-to-year their regular season point total hasn’t continued to rise over the past few years, through they’ve still been mired in third through fifth place in one of the WHL’s strongest division. With a chance to cross over and take on the best the B.C. Division has to offer, is this the year the Americans can take another run at that first championship in franchise history?